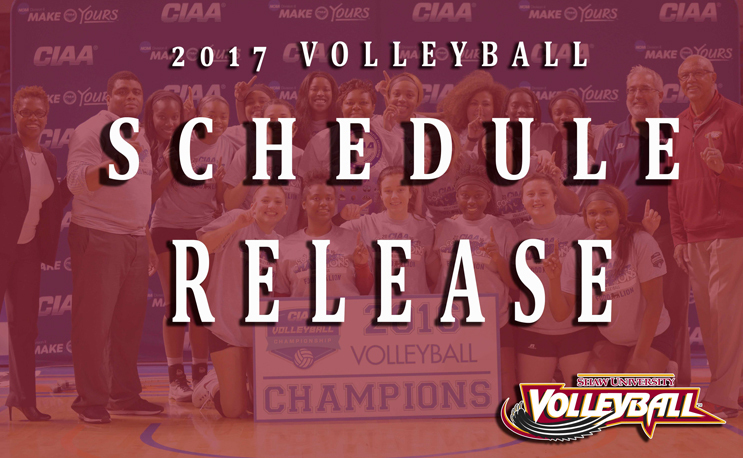 RALEIGH, NC – The Shaw University women’s volleyball team is set for the 2017 season as two-time Central Intercollegiate Athletic Association (CIAA) Coach of the Year – head coach DiShondra Goree announced her team’s upcoming 2017 schedule. Shaw will face 13 non-conference opponents, including one team that participated in the 2016 NCAA Tournament. The Lady Bears will see action in two non-conference tournaments and two conference round-ups this season. The Lady Bears ended the 2016 season with a 22-8 record, and claimed the 2016 Central Intercollegiate Athletic Association (CIAA) title after going 15-1 within the conference. For the second-consecutive year, the Lady Bears reach the 20-win mark. Shaw is set to begin the 2017 season with a total of 12 returning players who was a part of the championship run a season ago, including all seven starters. Shaw will begin the season with an exhibition match with Wake Tech and an alumni scrimmage before its season opener and home opener versus Claflin, who finished the season 19-8 a year ago, Sept. 1 in C.C. Spaulding Gymnasium. The Lady Bears will hit the road for an 11-game skid from Sept. 5 to Sept. 21, including participating in the Concord Classic in Athens, WV (Sept. 5-9) and the CIAA Round-Up (Sept. 15-17) in Winston-Salem, NC. On Sept. 21, SU will begin divisional play with a road match at Livingstone. For its second home contest on the season, Shaw will host Lees-McRae for the first time in program history (Sept. 22) and will meet Johnson C. Smith (Sept. 25) for a conference division matchup. The Southern Division Champions will then face Elizabeth City State, (Sept. 30), Virginia State (Sept. 30) and Bowie State (Oct. 1) in the second CIAA Round-Up in Petersburg, Va. Four days later, the Lady Bears will host Winston-Salem State on Oct. 5, following a three-game road slate at Fayetteville State (Oct. 9), Saint Augustine’s (Oct. 12) and Claflin (Oct. 14). After a home match versus Livingstone on Oct. 16, Shaw will wrap up the nonconference portion of the schedule with road contests at the Barton College Tri-Match. The Lady Bears will take on both Mount Olive and Barton on Oct. 21 in Wilson, NC. The following week, Shaw will stay on the road, when they travel to Johnson C. Smith (Oct. 23) and Winston-Salem State on Oct. 30 for CIAA Southern Division action. The Lady Bears will wrap up the home portion of the schedule and conclude the regular season Nov. 6 and Nov. 9, when Shaw takes on Fayetteville State and Saint Augustine’s. The league championship that will be contested on the week of Nov. 17-19 and will once again be a bracket-style tournament with eight teams qualifying based upon league standings at the end of the regular season. The championships are schedule to be held in Petersburg, Va., at the Virginia State University Multipurpose Center. Dates and times are subject to change. All Shaw home volleyball games are free admission. A complete schedule can be found here. For the most up-to-date information on Shaw women’s volleyball and its 13 varsity sport teams, please visit www.shawbears.com.